The Boeing Company (Chicago, IL) developed a process that reduces the amount of the rhenium used in high temperature applications such as rocket propulsion systems without sacrificing its high temperature and mechanical properties. Cryomilling in the presence of nitrogen is used to prepare rhenium alloys with a stable fine grain structure at high temperatures, according to inventors Jerry W. Brockmeyer and Clifford C. Bampton. The rhenium nano alloy has high temperature strength and ductility superior to conventionally processed rhenium and earned Boeing U.S. Patent 7,592,073. The rhenium alloy contains a refractory compound which may include one or more of hafnium (Hf), zirconium (Zr), tantalum (Ta), silicon (Si), vanadium (V), and titanium (Ti), and which makes up between 0.1% and 10% of the alloy by weight. The rhenium prices surged to a record of more than $11900 a kilogram in 2008, more than double the 2007 level and up from about $1000 in early 2006. Rhenium prices have since moderated to about $6500 per kilogram in October 2009 on the spot market. Rhenium demand is expected to remain strong. Both Boeing`s and Airbus’ estimate a demand for 30,000 new jets over the next twenty years. That equates to a demand on average of 60 metric tons of rhenium a year for next two decades as about 20 kgs of rhenium is needed per engine. The top three consumers GE, Pratt & Whitney and Cannon Muskegon are expected to consume an estimated 45 metric tons per year. World production of rhenium in 2008 was 57,900 kilograms. It is not difficult to see how nano-rhenium may be a very important cost saver. The refractory compound comprises a nano-scale dispersion that is incorporated into the conventional rhenium structure. The nano-scale dispersion acts as grain boundary pins that result in a relatively fine grained, equiaxed structure that helps to improve the mechanical properties of the alloy and helps to minimize the growth of large grains during operations at high temperatures. Carbon nanotubes, similar to the refractory compounds discussed above, may also act as nano-scale pins that help prevent the growth or the rhenium grains at higher temperatures. Carbon nanotubes typically have a lower density and weight than refractory compounds containing refractory metals. As a result, the overall weight/density of the rhenium alloy may be reduced which may result in reduced weight structures and/or enhanced density-specific properties. Many rocket propulsion systems use either a pressure fed system or a turbopump system that transfers propellants to the combustion chamber where they are mixed and burned to produce a high velocity stream of heated gases. The stream of heated gases is then exhausted through one or more nozzles to provide the desired thrust. Typically, combustion takes place at temperatures that may be in excess of 6000 F., which may be higher than the melting point of most conventional engine materials. As a result, in the absence of active cooling, it may be necessary to line the interior of the combustion chamber with a material having a high melting point and oxidation resistance. Boeing’s nano rhenium alloys have melting temperatures as high as 6150 degree F (3400 degree C). Iridium-coated rhenium is a material that is commonly used to line the interior of the combustion chamber. Iridium provides high temperature oxidation resistance and has an intrinsic resistance to oxidation. Rhenium has a higher melting point than iridium and excellent high temperature structural capability. Iridium and rhenium are dense materials that are prohibitively expensive. As a result, the use of iridium and rhenium may increase the overall cost and weight of the propulsion system. Boeing is able to reduce the amount of rhenium needed while improving the alloys’ heat resistance. The processing of rhenium presents several challenges. In many applications, chemical vapor deposition (CVD) fabrication is used. Typically, high temperatures are needed to deposit rhenium using CVD. However, conventional equipment for CVD produces temperatures on the order of 1000.degree. C., which is much lower than the melting point of rhenium. CVD also typically requires relatively expensive starting materials and processing reactors that are relatively expensive to run and maintain. Other methods of processing rhenium, such as electrodeposition, may also present challenges and may result in the rhenium having an undesirable grain size. Post-processing, e.g. machining of rhenium, may also be difficult because of the high work hardening coefficient of rhenium. The advantageous properties of rhenium may also be adversely affected, in part, by the processing conditions. For instance, in many cases rhenium properties may be dynamic when exposed to high temperatures. This dynamic behavior may result from grain growth that can occur at higher operating temperatures. Grain growth may decrease the mechanical properties of rhenium. Additionally, current methods of processing rhenium typically result in relatively large grain structures or grain structures that have an acicular grain structure. Such grain structures tend to increase the difficulty of processing rhenium and may also result in the rhenium having reduced mechanical properties, such as strength, at higher operating temperatures. Many rhenium processing disadvantages are overcome by "cryomilling" which is the fine milling of metallic constituents at extremely low temperatures. Cryomilling takes place within a high energy mill such as an attritor with metallic or ceramic balls. During milling, the mill temperature is lowered by using liquid nitrogen or a similar compound to a temperature of between -240.degree. C. and -150.degree. C. In an attritor, energy is supplied in the form of motion to the balls within the attritor, which impinge portions of the metal alloy powder within the attritor, causing repeated comminuting and welding of the metal. As-milled grain sizes in these metal powders are on the order of 50 to 100 nm. Building Materials Investment Corporation (Wilmington, DE), a part of GAF Materials Corporation the largest U.S. roofing materials manufacturer, has patented an asphalt nanocomposite materials that can be used in roofing shingles and other building materials The asphalt-based nanocomposites are particle-filled matrices that include an asphalt flux or derivate and a layered clay mineral in an amount ranging from about 1% to 15% of weight. The nanocomposites result in improved mechanical properties such as heat deflection temperature, increased stiffness, higher tensile strength and better fire retardancy. The asphalt-based nanocomposite is a nano-dispersion that is characterized as having higher melt viscosity as well as new crystallographic order evidenced in wide-angle X-ray diffraction (WAXD) studies. Such nanocomposites have superior tensile strength and significantly higher Young's modulus relative to their respective raw or filled coatings without nanoclays. The asphalt-based nanocomposite can be used as a coating for any material layer of a roofing shingle, according to inventors Vinay Mehta, Brian Kanze, Krishna Srinivasan and Awdhoot Vasant Kerkar, writing in U.S. Patent 7,582,155. It is worth noting, that the term "asphalt-based nanocomposite" denotes a composite material comprising asphalt as the major component. This system is distinct from polymer-based nanocomposites, in which a polymer is the major component. The asphalt-based nanocomposite is made of particle filled layered clay minerals dispersed into a matrix of asphalt. The asphalt molecules intercalate (or exfoliate) between the clay mineral layers. decrease in ultimate elongation was, however, anticipated since the addition of polymer-based nanocomposites to different systems in the prior art also shows a similar decrease in elongation. The decrease in ultimate elongation is a result of a stiffer product being formed when the nanocomposite is employed. Layered clay materials such as, for example, montmorillonite, hectorite, saponite and the like, are composed of silicate layers that have a thickness of about 1 to a few nanometers. Dispersions of such layered clay materials in polymers are frequently referred to as polymer-based nanocomposites. These are the type of nanomaterials used in the asphalt nanocomposite. The asphalt-based nanocomposite can be prepared using a variety of methods, including: (1) a direct blending method; (2) a method in which asphalt is first fractionated into its multiple (usually four) components and then a layered clay mineral is blended therein; (3) a method in which a layered clay mineral is added to an asphalt flux or derivative thereof prior to blowing (i.e., oxidizing); or (4) a method in which asphalt flux or its derivative is first solubilized in an organic solvent, then mixed with a layered clay mineral and thereafter evaporated to remove the organic solvent. Mixed nanoscale electrolyte powders provide a significant advance in the technology of ceramic cathode and anode materials for solid oxide fuel cells, as well as other electrochemical device applications, according to NexTech Materials, Ltd. (Lewis Center, OH) scientists. Particularly significant in this regard is the potential for improving performance of solid oxide fuel cells while reducing the operating temperature and allowing for efficient internal reforming of hydrocarbon fuels, say Matthew M. Seabaugh and Scott L. Swartz in U.S. Patent 7,595,127. Nanoscale electrolyte powders are made from yttrium-stabilized zirconia, a doped ceria electrolyte material, barium zirconate, scandium-doped zirconia, a lanthanum gallate based ceramic electrolyte material, a bismuth oxide based electrolyte material, and combinations of the materials. By producing these powder mixtures on a nanoscale (e.g., less than 100 nm in dimension), improved electrode performance is obtained. Other applications where advanced electrode materials are needed include ceramic electrochemical gas separation systems, gas sensors, and ceramic membrane reactors. Currently, most developmental SOFC systems operate at relatively high temperatures (i.e., 800 to 950.degree. C.). At these high temperatures, the electrode materials provide suitable performance using conventional means of preparation. However, at these high temperatures, with current anode materials, hydrocarbon fuels must first be converted to a mixture of hydrogen and carbon monoxide (for example, by reacting the hydrocarbon with steam); the mixture of hydrogen and carbon monoxide is then delivered to the SOFC where power is generated. Without this external "reforming" step, carbon would deposit onto the anodes of the SOFC and performance would degrade rapidly. Operation of SOFCs at lower temperatures (650 to 750.degree. C.) would allow internal reforming at the anode without carbon deposition, thus reducing size and cost of the system and increasing overall efficiency. Lower operating temperatures also will minimize adverse chemical reactions between component materials, minimize adverse effects of thermal expansion mismatches between component materials, reduce cost by allowing less expensive metals to be used for interconnects and gas manifolds, and reduce the size and weight of the SOFC power generation system by lessening requirements on heat exchangers and thermal insulation. The nano-composite approach improves electrode performance over the entire temperature range of the measurements, but the effect is most pronounced at lower temperatures. According to Seabaugh and Swartz, it is critical that the proper calcination temperature is used after mixing of the electrolyte and electrode powders in order to achieve the lowest electrode resistance. The performance of each of the nano-composite electrode formulation is modulated by the starting surface areas of the component materials, the relative volume fractions of each component, and the calcination temperature used after mixing and before preparation of screen-printing inks. If the calcination temperature is too high, then performance can be degraded either by reaction between the two phases or due to loss of active surface area for reaction. When the calcination temperature is too low, the performance can be degraded due to poor particle-to-particle contact (and loss of electrical conductivity) in the highly conductive perovskite phase. The optimum calcination temperature depends on specifics of the formulation (e.g., relative volume fractions of each phase, and the starting particle size and surface area of each phase, the degree of mixedness achieved prior to calcination and the surface area of the nano-composite powder after calcination. By following the teachings of this patent, one can design an optimum nano-composite electrode material for a given set of end-member compositions. As solid oxide fuel cell technology enters product commercialization, long-term stability of SOFC cells and stacks becomes critical to the commercial success of the industry. To maintain low stack and system costs, coatings for low cost metallic interconnect materials are required, which do not allow chromium volatilization or uncontrolled oxide scale development during operation. Developing cost effective means of synthesizing and depositing these coatings requires careful development of materials processing and deposition technology. stack manufacturing costs. To allow low cost assembly of stacks and long term stability, cathode contact paste materials are required which provide high conductivity at anticipated stack assembly temperatures. The materials must demonstrate sufficient sinterability to developadequate electrical contact at stack assembly temperatures while maintaining porosity over long-term operation. “FUEL CELLS, HYDROGEN ENERGY AND RELATED NANOTECHNOLOGY – A GLOBAL INDUSTRY AND MARKET ANALYSIS,” published by Innovative Research and Products Inc. (iRAP, Inc) and authored by Alton Parrish, provides an in depth look at the markets for fuel cells and nanotechnology used in manufacturing fuel cells and in producing and storing hydrogen. For more information please visit iRAP’s website. The 773 page report examines the activities of more than 3800 companies and public organizations developing fuel cells, hydrogen energy and enabling nanotechnology. 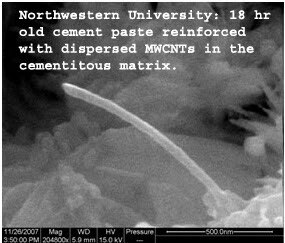 Northwestern researchers invented a process to use multi-walled carbon nanotubes (MWCNTs) at very low levels in conjunction with additives and mixing methods that provide excellent MWCNT dispersion in cement matrixes and afford significant improvement in cured mechanical properties. An aqueous MWCNT (0.08 wt% cement basis) additive solution, after suitable mixing, is blended into cement under ASTM procedures, cast and cured. Scanning electron microscopy (SEM) analysis of fracture surface specimens after 18 hours reveals isolated MWCNT fibers with a high degree of dispersion in the matrix. The uniform MWCNT distribution contributes to the observed increase in cured cement mechanical properties. Over 45% increase in the 28 day flexural strength is realized at the 0.08 wt% MWCNT loading versus the unmodified control. This modest MWCNT addition inhibits cracking at the nanoscale level and provides a cement matrix essentially “crack free”. The current invention promises a cost effective technology to provide high strength cements in a direct and scalable process. Most construction cements today are hydraulic, and generally based on Portland cement, composed primarily of limestone, certain clay minerals and gypsum. Effort to mitigate structural failures in cement is a constant endeavor that has employed a range of materials. Although microfiber reinforcement has led to significant improvement of cement mechanical properties, flaws at the nanoscale remain. Carbon nanotubes (CNTs) have been added to cementitious matrices at 0.5 to 1.0 wt% loadings to overcome such defects but suffered from poor dispersion and cost. Northwestern researchers Surendra P. Shah, Maria S. Konsta-Gdoutos, and Zoi S. Metaxa were able to overcome the major obstacle to the manipulation and use of carbon nanotubes for reinforcement in cementitious materials which has been their poor dispersion in cement. A composite cement material was prepared from cement material and carbon nanotubes from about 0.02 wt % to about 0.10 wt % based on weight of cement material. The process for preparing such cement compositions includes sonicating a mixture of a surfactant, water, and carbon nanotubes; blending the dispersion and the cement material to form a cementitious paste. The composite cement materials are useful in a variety of cement applications where a reduction in nanoscale flaws and fractures is desired. The nanocomposite cementitious material exhibits a reduction of autogenous shrinkage of at least 30% after 96 hours from casting as compared to the same cementitious material without carbon nanotubes. The nanocomposite cementitious material exhibits a modified nanostructure so that the average values of stiffness and hardness of C-S-H, as determined by nanoindentation tests, are higher compared to the same cementitious material without carbon nanotubes. The nanocomposite cementitious material exhibits an increase of the Young's modulus of at least 15% up to about 55% as compared to the same cementitious material without carbon nanotubes. The nanocomposite cementitious material exhibits an increase in flexural strength of at least of 8% up to about 40%. as compared to the same cementitious material without carbon nanotubes. CNT cement composites are expected to find wide application for highway structures, bridges, pavements, runways for airports, continuous slab-type sleepers for high speed trains and in general in all applications of conventional and high strength concrete, as well as in manufactured precast elements for residential and commercial buildings. By using catalytic and magnetic nanoparticles, two Massachusetts Institute of Technology (Cambridge, MA) researchers have discovered a better way to destroy deadly chemicals found in the environment and that terrorist could use in a attack. The presence of organophosphate esters (OPE) in industrial and agricultural drain waters, spills, runoffs, and drifts, as well as OPE agent-based chemical munitions that may be released in case of warfare or terrorist attack, pose great risks to human health and the environment. The number of exposures to OPE due to pesticides and insecticides is estimated at some 3,000,000 per year, with the total number of deaths and casualties over 300,000 per year worldwide. U.S. Patent 7,598,199 reveals how these deadly chemicals can be safely and more easily detected and removed from the environment. T. Alan Hatton and Lev E. Bromberg developed compositions and methods for sorbing and destroying organophosphate chemical agents. To this end, the researchers use finely divided, modified nanoscale metal oxide particles. A suspension of magnetite (Fe3O4) nanoparticles modified with 2-pralidoxime or its polymeric analog, poly(4-vinylpyridine-N-phenacyloxime-co-acrylic acid), catalyzes the hydrolysis of organophosphate compounds at a neutral pH. The oxime-modified magnetite particles serve as a nano-sized particulate carrier with a powerful .alpha.-nucleophile, e.g., an oximate group, immobilized on its surface. 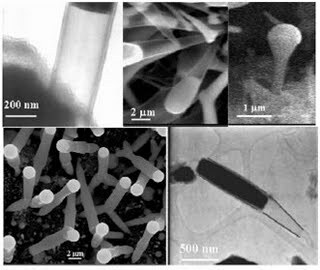 The oxime-modified magnetite nanoparticles are colloidally stable at neutral pH and they are readily recovered from the aqueous milieu by high-gradient magnetic separation methods. Advantage can be taken of the superparamagnetic properties of the magnetite particles to separate the catalyst from the reaction medium following use, allowing multiple uses. The immobilized metal complexes have uses in addition to their use to decontaminate areas contaminated with nerve agents and/or pesticides. For example, the catalytic hydrolysis of nerve agents or pesticides using the nano-compositions can be employed as the operative process step in a detector system wherein the by-products of the hydrolysis reaction, such as hydrogen fluoride, may be subject to measurement to provide an indication of the presence and concentration of a particular phosphate ester in the environment. Additionally, the adsorbent nucleophilic particles may be fabricated in the form of filters, sponges, wipes, powder or any other form suitable for use in a decontamination process. For example, the particles may be used in gas masks, wearable protective garments, air filtration systems, and the like. Numerous OPE pesticides, insecticides and warfare agents, such as sarin, soman, and VX, in addition to being carcinogenic, act as nerve poisons which may cause cumulative damage to the nervous system and liver. Organophosphorus pesticides and warfare agents are not readily hydrolyzed in aqueous media without applying extremes of pH, heat, or bleach. At present, the decontamination solutions of choice are DS-2 (a non-aqueous liquid composed of diethylenetriamine, ethylene glycol, monomethyl ether, and sodium hydroxide) and STB (super tropical bleach). Although DS-2 is generally not corrosive to metal surfaces, it damages skin, paints, plastics, rubber, and leather materials. STB, while effective, has the same environmental problems as bleaches and cannot be used on the skin. Consequently, personal decontamination equipment typically consists of packets of wipes containing such chemicals as sodium hydroxide, ethanol, and phenol. Hatton and Bromberg’s discovery presents a safer and easier alternative to DS-2. University of Louisville Institute for Advanced Materials and Renewable Energy (IAM-RE) Director Dr. Mahendra Kumar Sunkara and Intel Process Engineer Gopinath Bhimarasetti developed a technique to synthesize, control and fine tune the morphology of tubular carbon nano structures. Their invention provides a means to control the inner and outer diameter of the tubes and provides the means of controlling the wall thickness of the tubes. Different morphologies of tubular carbon such as tubes, cones, nozzles, funnels, tapered tubes, barbells, Y-junctions and multijunction tubes, can be synthesized reliably. The technique is based on the wetting behavior of gallium with carbon in different gas phase growth environments. The walls of the various nanocarbon shapes exhibit a very unique structure. Unlike multi-walled carbon nanotubes (MWNTs), the wall is not comprised of graphene sheets rolled into a cylinder. Instead, the wall is made of parallel sets of nanocrystals of graphite in the size range of 2-5 nanometers (nm). The internal diameters of the carbon tubular structures can be varied from a few nm to as high as about 25 microns. The wall thickness is about 10-20 nm. The carbon tubular structures can be formed open on both ends and are directly applicable to micro-fluidics. The figure illustrates a variety of shapes created by using methane as a carbon source and gallium as the wetting agent. The University of Louisville Research Foundation, Inc. (Louisville, KY) received U.S. Patent 7,597,941 for the work. The carbon tubular structures have use as nano fluid delivery systems, absorption and percolation medium, electronic devices such as junction diodes made of multi-junction tubular structures, lithium exchange medium in batteries, ink delivery systems for printer cartridges, and hollow funnels or nano-crucibles for metal alloy production permitting the containment and handling of very small amounts of material such as for combinatorial synthesis, and for micro-reactors for combinatorial synthesis. Furthermore, the tubular carbon nano/micro structures having tunable internal diameters and conical angles can provide flow channels, flow distribution channels, control valves/throttle valves in microfluidic devices. The materials also provide a medium for lithium intercalation electrodes, pico-liter dispensers, templates for synthesis of similar morphologies of other materials systems, micro-reactors, and nano test tubes to study fluid flow behavior and materials behavior at various length scales. The process is based on changing the wetting behavior of a low melting metals such as gallium, indium, and aluminum with carbon using a growth environment of different gas phase chemistries. In the presence of oxygen or nitrogen, gallium wets carbon, thus forming a flatter meniscus during growth. Based on this behavior of gallium various morphologies of carbon nano-structures can be successfully controlled and synthesized. Gallium that partially fills the carbon structures can be removed from the tubes by simple heating in vacuum at temperature above 600.degree C. Gallium required for the growth of the carbon tubes can be supplied either as a thin film on the substrate or could be supplied through the gas phase with different precursors such as Tri-methyl gallium. The nanostructures can be synthesized using any kind of gas phase excitation such as microwave excitation, hot filament excitation, thermal excitation and Radio Frequency (RF) excitations. This growth concept can be extended to synthesize tubular morphologies of other material systems.